As a business owner, do you know what your staff are entitled to, types of sick pay or what you should be paying them? All employers must pay Statutory Sick Pay (SSP) for their workers. This is currently £92.05 per week for up to 28 weeks. The government has a useful calculator for you to work out how much you need to pay. When do you start and stop paying SSP? The SSP ‘qualifying day’ starts from the fourth day in a row that the employee is off sick. For the first three days of sickness, otherwise known as ‘waiting days’ you don’t need to pay them anything. However, if the employee has been off sick and receiving SSP within the previous eight weeks then you do need to pay them within the first three days. You stop paying SSP when the employee returns to work. However, if they are on long-term sick then SSP stops after 28 weeks of consecutive absence. It also stops if an employee starts receiving statutory maternity pay or maternity allowance. If the employee has worked for a minute or more before they go home sick, then this is not classed as a sick day. It is paid in the same way as you would pay staff wages, deducting tax and National Insurance. Do you need to keep a record? Technically you don’t, and you can choose how you record your employees’ sickness absence, but it recommended to keep records in case the HMRC asks to see them in case of a potential dispute over payment. Employees can’t take holidays or be paid for bank holidays whilst receiving SSP. Check your processes so that you are able to answer questions on this if asked. If an employee is taking a phased return to work, you cannot top up the salary with SSP – so they will remain on reduced earnings. Be sure to communicate that their salary is going to be lower during this period. If a member of staff is sick whilst on holiday they should notify their manager and then use their holiday at a later date. This is something which should be included in the company policy. This is your own company scheme, also known as Company Sick Pay or contractual sick pay, which pays more than SSP and is usually offered as part of an employee benefits package. It is important to be clear that it is inclusive of SPP. This is down to your discretion; the only rule is that it can’t be less than SSP. Some businesses are happy to pay full pay, whilst others offer 50%. However, it’s important to forecast how much you could afford and take into consideration scenarios of long-term sickness and the financial burden this may place on your business. Who qualifies for company sick pay? This is down to your business; some companies offer it to all employees as soon as they start, and others offer it after an initial probation period. You must ensure you treat all employees the same however otherwise you could leave yourself open to claims of discrimination. How do you pay company sick pay? Again, this goes through the payroll as per usual pay. 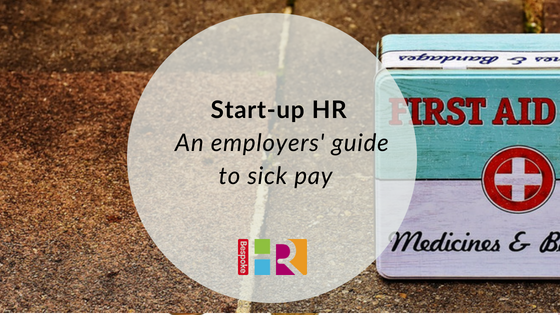 Remember, the business can still claim the SSP for an employee who is in receipt of company sick pay, so you are really topping up. Get in touch to chat to us about sick pay and your options.